The women’s basketball team will host their ninth annual “Play 4 Kay” game on Saturday, Feb. 11. Yow battled cancer and later passed away from breast cancer, and the fund was set up in her honor. The Kay Yow Cancer Fund was founded on Dec. 3, 2007, and has raised $5.28 million for women’s cancer research. “You’re playing for a woman who was a coach for 38 years in college basketball. She had over 1,000 wins and was an iconic person, so looking up to that and playing for her brings more passion to the game,” said guard and forward Kaylah Pinkney, ’19. To show their support for the Kay Yow Cancer Fund and breast cancer awareness, the women will wear pink warmup shirts, pink socks and decorate the gym with posters. Guard Madison Caufield, ’18, said the game is in honor of women who have battled breast cancer and their families. Costanzo said the game is about raising awareness and is a unifying cause for college teams across the country. “Whether it’s your opponent or other Division I schools, everyone is hosting a Play 4 Kay game, and it’s unifying. Obviously it’s fun to see everybody wearing the pink shirts and raising awareness in that way, and it’s become a nice tradition for us,” Costanzo said. The women participated in The College of Wooster’s Play 4 Kay game when they played at Wooster on Wednesday, Feb. 8. The Gators will play Denison University for their own Play 4 Kay game. Caufield said in the first game against Denison this season, the team did a good job playing against Denison’s All-American forward, Jordan Holmes. “Playing like we did and having confidence in one another, working well together defensively and finding our open shots is what we’re looking to improve,” Caufield said. Pinkney said the team is excited to have the opportunity to play Denison again because the first game was close but the team lost in the end. “Every time we play Denison we know we have a chance of winning which is exciting. We want to come out on top every time we play them,” Pinkney said. 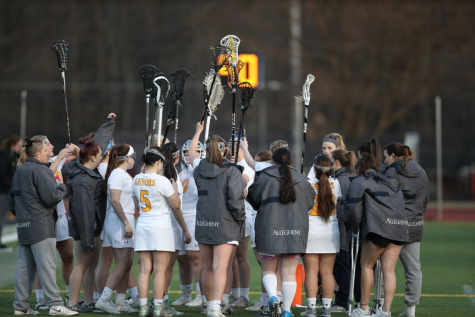 Following the Denison game, the women will have two conference games left and are hoping to finish the season with a solid foundation for next season, according to Costanzo. “We’ve got young players that are getting a lot of experience that will be invaluable in the next seasons,” Costanzo said.